Use our online catalog to place a secure order for any of our products. We are ready for your call Monday through Friday from 8:30 a.m. to 5:00 p.m. EST. We will verify your account and order; then we will bill your account for the amount of the order plus shipping and handling. We accept MasterCard, Visa, and Bankcard (sorry we do not accept Diners or AMEC at present). Payment is due upon receipt of merchandise with an established open account. Are there any taxes on safety items? Yes, 10% GST is applied to the prices listed on the site. Are the prices the same online as in catalogs? Prices are the same in catalogs and on this site. Occasionally, we will have special pricing offers available only on this site. If you encounter difficulty placing your order with our online catalog, please call our customer service department at (02) 9756 0822 or email us and we will contact you in a timely manner. 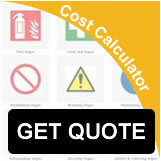 Orders for standard products are normally shipped within 24 hours of confirmation of payment. Custom Made orders typically take 2 to 5 working days plus delivery time from time of artwork approval and confirmation of payment. Some orders are subject to longer time frames for manufacturing and delivery due to their complexity or the time of year. 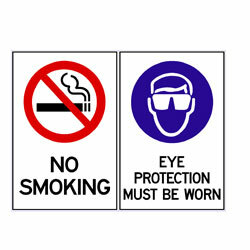 Please e-mail us at info@safesigns.com.au or call Customer Service at (02) 9756 0822. Yes, it may be possible to alter your order, depending on its stage in the fulfillment process. Call (please do not e-mail or fax) Customer Service at (02) 9756 0822. Will you automatically send me a proof for personalised items? Yes. These are usually emailed for you approval – we do not commence until we have written approval. Note, the production time does not commence until approval and or payment has been confirmed.